SOS Children's Villages is making homes available to families crossing the border, says emergency response coordinator Sergio Marques. SOS Children’s Villages Brazil is mobilizing to help children and families from Venezuela who have sought refuge in the country. An estimated 1.5 million Venezuelans have been displaced over the past year, many seeking refuge in neighboring Colombia and Brazil. The Brazilian government estimates that 800 Venezuelans arrive in Brazil every day and more than 70,000 have crossed the border in the past year. Most cross the border near Pacaraima, in Brazil’s northern Roraima state, and continue for another 200 kilometers to capital Boa Vista. More than 40,000 Venezuelans are refugees in the state of Roraima, mainly living in Boa Vista and Pacaraima. An emergency response program for Venezuelans has also been launched in Colombia, the largest destination country for those leaving Venezuela, with thousands crossing the border every day. 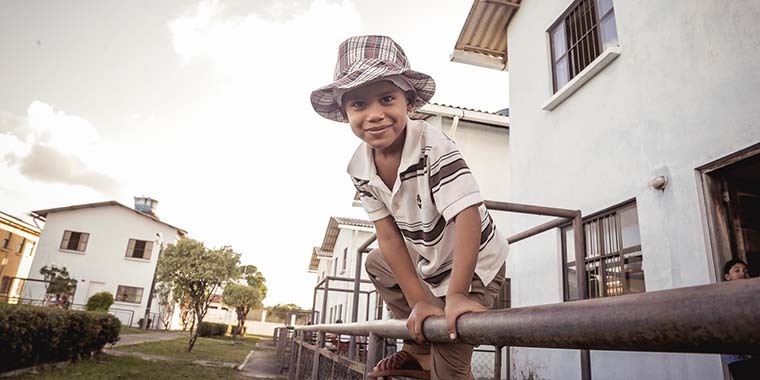 SOS Children’s Villages Colombia is particularly concerned about the risks refugee children face as their families struggle to find shelter, food and health services. Sergio Marques, who responsible for the SOS Children’s Villages Brazil emergency response for the Venezuelan refugees, explains the needs of families and how the organization plans to help. What are the main needs of the children and families who are arriving from Venezuela? There is an urgent need for housing for the families and education must be prioritized for the children and adolescents. Many of the families already faced hardships before they arrived in Brazil. So if the situation continues, adults will need employment so they can meet the needs of their families. Are their immediate needs being met? There are nine government-operated shelters near the border that provide immediate assistance, such as food, water and shelter. But the situation is precarious. The shelters are overcrowded because more Venezuelans arrive every day, and this puts pressure on both the host community and those arrived from across the border. Are you seeing cases of family separation or children travelling alone? Our latest information shows there are no registered cases of children or adolescents traveling alone at the shelters in Boa Vista or Pacaraima. However, one of our priorities is to keep families together by working to ensure that they have adequate housing, schooling and health care and social services. If there are cases where children are separated, we are prepared to work with the authorities to ensure their safe and timely re-unification with their parents or other loved ones. The number of people arriving from Venezuela has been on the rise for months. How are Brazilians reacting to the situation? There is evidence of growing prejudice against Venezuelans, particularly in Boa Vista, where an estimated 40,000 Venezuelans are now living. They now account for nearly 20% of the official population of the city. The general overcrowding and impact on social services is creating friction with the local population. We are offering to relieve some of the overcrowding by providing houses to Venezuelan families at two SOS Children’s Villages, Goioerê and Igarassu. We believe that helping provide families with safe and adequate housing, getting children into schools and involved in activities, and creating employment opportunities for adults so that they can support their families, will go a long way to reduce tensions. There is a need to address the immediate needs but also to be prepared for longer-term support for the children and families in the affected communities. Providing residents of two shelters with vocational and local language courses, referrals to the social assistance network, and financial support to families. An estimated 1,600 people will be helped through this intervention. Supporting refugees by providing at least two SOS homes for Venezuelan families at the Goioêre and Igarassu Villages. This will assist 600 people in 30 households for up to six months. Ensuring that the rights of children and adolescents are guaranteed in shelters, in accordance with national laws. Providing temporary accommodation for families at SOS Villages Goioerê and Igarassu. Offering Portuguese language lessons for children and adults. Promoting access for Venezuelans to education and ensuring that children are enrolled in school. Ensuring that families have access to sufficient food, water and sanitation to meet their basic needs. Helping families gain access to health care.